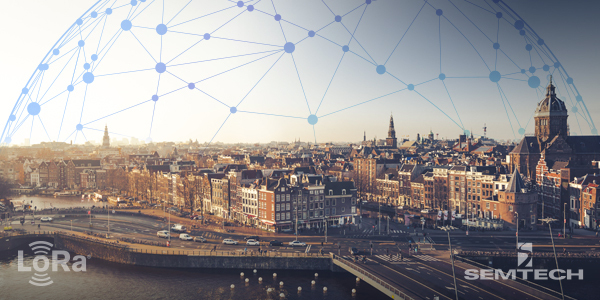 Next week, thousands of Internet of Things (IoT) developers from around the globe will head to Amsterdam for The Things Conference, organized by The Things Network. The event promises to provide attendees with the content and knowledge to tackle LoRaWAN™-based development head on, and bring more solutions based on Semtech’s LoRa® devices and wireless radio frequency technology (LoRa Technology) to market. Steven Hegenderfer, Senior Director of the Developer Ecosystem, Semtech Wireless & Sensing Products Group, shares his excitement for The Things Conference and advice for LoRa-based developers in the Q&A below. How is LoRa Technology helping developers bring the promise of IoT to life? When we talk about IoT-connected devices and the volume of data shared device to device, we’re typically not talking about large amounts of data or bandwidth usage, like video or audio. We're talking about brownfield things including legacy equipment in environments, perhaps in manufacturing, agriculture, buildings, or cities, that simply need to be monitored. I think people forget that the first step to IoT is actually just getting the telemetry off of devices. Additionally, IoT is more than just an office building or a house - it's an entire community, a universe of things. This is where low power, wide area networks (LPWANs) come into play. We have brownfield-type devices where equipment may be scattered over an area – indoor or outdoor, urban or rural – where communication might need to go kilometers and not just meters. The messages aren't massive amounts of data requiring immense bandwidth. In situations where distance and obstacles prove a challenge, LoRa Technology is an efficient and cost effective platform for IoT solutions. The flexibility and long range, low power qualities of LoRa Technology create advantages which developers could not otherwise achieve. This is proven by the immense library of known use cases for LoRa Technology – some of which you can see featured here. The continued success of The Things Conference is more proof that LoRa Technology is becoming the de facto choice for LPWAN connectivity, and this is very exciting. More and more developers are adopting LoRa Technology and using it for different types of applications – smart metering, supply chain, agriculture, homes, buildings, and cities. Enterprises in these markets are experiencing the business value of LoRa-based IoT solutions, and developers are finding it easier to create their own solutions and bring them to market. At Semtech, our plans are to make LoRa-based development as friction-free as humanly possible. What advice would you give to a developer just learning about LoRa Technology and the LoRaWAN protocol, and attending The Things Conference for the first time? First, make sure you have a solid grasp on the technology, because you want to be able to focus on your applications and create business value with your solutions. You’ll find plenty of great topics at this event to grow your knowledge around the technology, so be sure to visit those sessions. Next, you need to learn if are there tools already available from the ecosystem that will allow you to build your application. Are there solutions already out there you can readily take advantage of to help bring your solutions to market quickly? In the meantime, you can find currently available solutions in the LoRa Community™ Catalog, or search #ShopLoRaWAN on social media. Finally, get to know the LoRa-based ecosystem. Who is out there? Who is making what? Talk to the people who have successfully deployed LoRa-based solutions in the market. Learn about their challenges, pitfalls and successes. What advice do you have for someone who has been developing with LoRa Technology for years? Take a look at the different businesses that are coming into the ecosystem now. These companies are offering different services to make it easier, from an infrastructure perspective, to get your IoT applications ready. Consider the booming growth of the LoRa Alliance™, over 500 members in just a few short years, and the recent membership of companies like Alibaba, Tencent and Google. The diverse and strong ecosystem backing LoRa Technology is a proof point of the technology’s ability to deliver on the promise of IoT. Pay attention to the advancements being made in the space. Are you rolling your own device management or over-the-air updates? How much do those cost for you to build and maintain? And who is now offering that as a service or bundled with their offerings? Maybe it’s one less thing you have to worry about, and you can partner with them for some parts of your solution. There may be companies in the ecosystem with open source offerings you can leverage. See what’s commercially available from the ecosystem. Can you be more efficient by utilizing that partner’s solution? Make sure that you explore how the partners in the LoRa Technology space are changing and adapting to more common norms… use that to your advantage. Meet Steven Hegenderfer and his colleagues, including the architects of LoRa Technology, at The Things Conference in Amsterdam from January 31 to February 1. Explore the program at the link below, and be sure to visit Semtech’s booth for daily giveaways. Semtech is a platinum sponsor of The Things Conference. Missing the live event? Follow @SemtechCorp on Twitter for live updates from the conference.